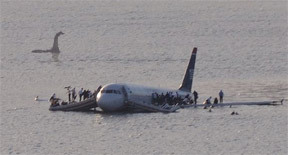 By now everyone has heard about the spectacular "crash" landing of Flight 1549 on the Hudson River two days ago. The "official" story is that a flock of birds got sucked into the plane's engines, causing them (the engines) to explode. The pilot aimed the crippled plane at the Hudson River where he landed without so much as crushing a rowboat. Everyone on the plane got out and stood on the wings until a ferry came by to pick them up safely. A passenger jet is literally hundreds of times bigger than a bird, but we're supposed to believe that running into a bird could crash an airplane? That's be like a gnat smashing its way into an elephant. Birds aren't dumb enough to hang around airports (they think airplanes are big enemy birds). I have dozens of birds in my home and not one of them has ever ventured near an airport. Are we supposed to believe that a ferry -- a boat specifically designed to pick up people -- just happened to be in the area of the crash? Also "ferry" sounds like "fairy," to make us think of this as a "magical" rescue, and the ferries came from a nearby "terminal" -- as in "terminal illness" -- to give the whole show an air of danger. In the pictures of the "rescue" it can be clearly seen that none of the passengers have luggage. Who goes on an airplane without luggage? Some of the passengers escaped on rafts. Why would an airplane have rafts on board unless the crew knew they were going to be in the water? Some of the people waiting to be rescued are clearly standing on water, not on an airplane wing. Was the plane filled with Criss Angel fans? It also doesn't make sense that people could stand on an airplane wing. I have a book on aircraft (the most comprehensive book on WW I-era aircraft ever published), and it clearly states that airplane wings are fabric stretched over wood. No way could cloth hold the weight of dozens of wet people. Photos of the accident are clearly fake. The plane seems to be partially sinking into the river, but air doesn't sink into a river, and an airplane must be lighter than air or it couldn't fly. The all-important engines are missing. Considering how important they are as evidence of what happened, wouldn't the pilot have brought them with him when he left the plane? A ruined airplane is a type of debris. Any trained pilot would know that it's illegal to dispose of debris in the Hudson River. The photos of the rescue show subtle signs of being faked (see below). The plain was an Airbus A320. 3+2+0=5. The plain ditched 5 minutes after takeoff. There was a crew of 5. 5+5=10. The plane was flight 1549. In numerology 1+5+4+9=10+9=1+9=10. 5 (from the previous item) is exactly half of 10, and the plain got through exactly half its flight plan (the half where it takes off). 5 (from the first item) + 10 (from the second item)=15, and the flight took place on January 15. There were (10+5)x10=150 passengers aboard. The airplane had logged 16,299 flights + the fatal flight = 16,300 flights. 1+6+3+0+0=10. The flight reached a height of 3,200 feet. 3+2+0+0=5, and it traveled this distance twice -- up and down -- so 5 + 5 = 10. The flight was also known as United flight 1919, twice 1+9 or two 10s, so the second name for the flight was two tens. 10 passengers were sent to Roosevelt Hospital for treatment of injuries. How often could ten be important to this flight and be a coincidence? So let's sort out the truth by asking ourselves who had something to gain from the crash. Well, obviously, George Bush, the soon-to-be ex-President, had a lot to gain. (The incident took place 5 days before his successor's inauguration, and a last-minute attempt to gain sympathy in politics is referred to as an "October surprise." The month number for October is 10. There's 10 and 5 again!) Bush orchestrated 9/11 -- a horrible disaster involving commercial airlines -- to start his Presidency, so could he have arranged for another airline show to end it? Flight 1549 takes off as normal. A CIA operative puts on a gas mask and introduces sleeping gas into the airplane cockpit. The operative takes over the airplane, disables the transponder, opens a window, and releases a remote-control "drone" that gives off signals so that aircraft controllers will think that they are tracking the real plane. Hundreds of trained pigeons are released near the airfield to provide cover and give legitimacy to the "bird strike" story. Flight 1549 is landed at a government airbase. Unconscious passengers and crew are unloaded, brainwashed, and released into society under new identities. The airplane is quickly shipped in unmarked containers to the banks of the Hudson, where it is stocked with actors and floated out into the river. The actors pretend to get rescued (they have been told they are filming a TV commercial for waterproof clothing). Once "rescued" the actors are debriefed and told that if they ever reveal that this was a hoax everyone they ever met will be killed and their SAG membership will be revoked. The trained pigeons are similarly captured, debriefed, and threatened. Fake footage of the crash is secretly introduced into nearby surveillance cameras and cell phones. President Bush calls the "pilot" and congratulates him, acting Presidential for one last time. Americans are distracted by the show for days while Israel continues to bomb baby-milk factories in Palestine. In this scenario, the whole operation could be carried out with only four or five people knowing that it was all fake (assuming that Cheney is competent at faking video footage and Bush can operate a telephone by himself). Makes sense, doesn't it? If it were true that President Bush ordered the downing of Flight 1549, this would be the biggest aviation conspiracy since Roosevelt torched the Hindenburgh. But, unfortunately for conspiracy fans, this was a legitimate accident punctuated by exceptional behavior by a pilot and crew. Those who want to delve into Presidential conspiracies need to look into Regan's behind-the-scenes involvement with the jellybean industry, the drugged pretzel used to replace G.W. Bush with Bush Clone #1.3.6, and the Carter/rabbit connection.